LOOKING TO GET A GIFT VOUCHER FOR A LOVED ONE ? Then you are in the right page ! --------- ____ BODY MASSAGES ____ 30min Massage of your choice 60min Massage of your choice 90min Massage of your choice ____ SIGNATURE TREATMENTS ____ 90min Hot Stone Treatment 90min On-The-Go Bliss Package 75min Jet Lag Treatment 90min Ultimate Bliss Treatment ____ FACIAL TREATMENTS ____ 45min Discovery Facial 45min Deep Cleansing Facial 60min Power Facial 75min The Classic Facial Treatment 90min Institute Collagen Facial Treatment 90min Intensive Regenerating Facial Treatment 90min Alysium Spa Facial Package ____ BODY WRAPS & SCRUBS ____ 45min Green Clay Body Wrap 45min Coconut Salt Body Wrap 60min Back Cleansing Treatment 60min Slim Ultra Performance Wrap 60min Celluli / Fluid Retention Wrap 60min Elixir Hydration Body Wrap ____ HANDS & FEET TREATMENTS ____ 30min Sports Foot Massage 30min Soothing Foot Treatment 30min Hand Treatment 45min Draining Leg Treatment ____ SPA PACKAGES ____ 2hrs Beauty Flash Package 2hrs The Detox Package 2hrs Perfect Bliss Package 2.5hrs Day Escape Package 2.5hrs Simply Soothing Package ____ COUPLES PACKAGES ____ 60min The Hour Couples Package 75min Couples Treatment with High Tea 90min Decadent Spa for Couples Package 2hrs Couple's Ritual Package ____ FOR MEN ____ 60min Optimale Men's Ritual treatment 90min Executive Escape 4-Men Package 60min Ultimate Bliss Package 2hrs Men's Delux Package ____ VALUE OPTIONS ____ $100 for treatments of your choice $150 for treatments of your choice $200 for treatments of your choice $250 for treatments of your choice $300 for treatments of your choice $350 for treatments of your choice $400 for treatments of your choice $450 for treatments of your choice $500 for treatments of your choice ____ SPECIAL OF THE MONTH ____ 30min Facial, 30min, Foot Treat & 30min Massage (April Special) . .
Alysium Spa Gift Vouchers can not be redeemed or use as exchange for cash, or any other value, nor can be redeemed or use as payment, nor can it be refunded. This Gift Voucher will expire in 6-months from the date of issue. Expired vouchers will lose 20% of its value per month from the date of expiry. 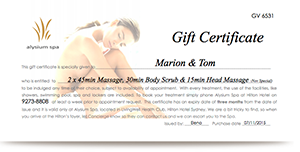 Gift Vouchers are only redeemable at Alysium Day Spa – Hilton Hotel Sydney and not at any other Alysium Day Spa location. Not valid during public holidays. Gift Vouchers can not be used towards the purchase of any promotion. When making an appointment, a minimum of two week’s notice is usually required and bookings are subject to availability. To make any changes or re-schedules your appointment, you must contact Alysium Spa directly. Please note a strict 48hrs notice is required otherwise the voucher’s redemption will be voided. Gift Vouchers are not transferable or can be redeemed by any other person other than the one intended for.